The ridiculous leaps to conclusions and false assumptions are as obviously fatally flawed as what he did on the autopsy film, which is also contained elsewhere on this site. In the following article Stan Friedman exposes Jeffrey’s paper for what it is… WORTHLESS! ent Jeffrey’s anti-Roswell conclusions (MUFON Journal, June 1997) are based on the same kind of false reasoning that led to his pro-Roswell views: don’t bother me with the facts, my mind’s made up; be enthusiastic and ready to put ones money where ones mouth is, but don’t have the facts in hand first; don’t bother finding out how security works; believe what one wants to believe; do one’s research by proclamation rather than investigation. Select from the data available to back up your conclusions and ignore the facts that don’t. Kent stated on a recent radio show with me that he has never had a security clearance and his article certainly shows over and over again that he doesn’t understand that higher classification info cannot be presented in lower classification documents, that having a particular level clearance is not enough to gain access to classified information, that one must have a need-to-know for that information, that people with high-level security clearances do not pass classified information on to people not having a clearance and need-to-know for the information. Kent decided the Santilli footage was fraudulent because of the curled phone cord. I asked if he had checked with the phone company. He said he didn’t need to. He knew there were no curled cords in 1947. He was wrong. The patent was granted in 1937 and production began in 1938. I tried to keep him from wasting his money on attorneys because no evidence had been presented that Frank Kaufman had played any role in intelligence in 1947 (he was a civilian clerk on the base) or needed legal counsel. Kent didn’t need any evidence because he and his father had a good visit with Frank. So he wasted thousands of dollars. I tried to get him to understand that it was ridiculous to jump from talking about events in New Mexico in July 1947, to demanding the President declassify everything learned about ETs since 1947 which might, of course, include technology of great importance from a military standpoint. I didn’t sign the Roswell Initiative because I do not believe technical data (defensive or offensive) should be put on the table for the Saddam Husseins of the world. Remember that one can’t tell one’s friends without telling one’s enemies. Kent can’t seem to understand the utter foolishness of his comment that information about ETs is “knowledge of profound importance to which we are all entitled.” Important? Certainly. But why does he think we are all entitled? There is an annual black budget of $30 billion. Our elected representatives obviously believe there is a great deal of information to which we are not entitled. Other foolish nonsense includes “The existence of a crashed alien spacecraft would have been much more of a social and scientific issue than a national security issue.” Is there no understanding that the government was confronted with a vehicle having exotic flight capability (clearly potentially useful for weapons delivery, for defense, for reconnaissance) whose origin wasn’t known, whose purpose wasn’t known, and whose technology would be useful, not only to the US, but to our enemies? What weapons did the aliens have? Would aliens work with our enemies? Would they be attacking Earth? These are major security issues. Kent hardly mentions the security level of the many documents to which he refers and which he proclaims would have certainly told about a crashed saucer. He acts as if he has seen all the relevant documents and as though all members of the advisory board would have had a need-to-know for compartmentalized information. Only one document, as it happens, was TOP SECRET and it dealt with “Analysis of Incidents,” not analysis of wreckage; two very different areas of technological investigation. I have been to seventeen Archives now. At none of them did I have access to Special Compartmented Information rated, for example, TOP SECRET/UMBRA or ULTRA, or MAJIC. W.B. Smith, in a 1950 TOP SECRET memo, said the matter of flying saucers was the most classified subject in the USA, even more than the H-bomb. Arid Kent thinks we are all entitled to know all about them!!! Kent talked to three former officers of the FTD — none of whom were at Wright in 1947. He insults them by saying that if they had known anything highly classified about crashed saucers, they would have told him (no clearance and no need-to-know) what they knew. The very reason they might have been so kind to him is that they wanted to be sure to dissuade someone so naïve that there WAS anything. Furthermore, I have several times been inside a vault at FTD when I was a project engineer on a contract with them for Aerojet General Nucleonics. It was a very compartmentalized place. The primary focus at FTD was paper work from foreign scientists, from spies, from intelligence analysts. I have trouble believing it was ever FTD’s job to go from analyzing wreckage to developing new technology. U-2, Stealth, the SR-71, and a myriad of other technologies were devised by industry under contract to major CIA or USAF or NAVY or Army groups; NOT at FTD. General Arthur Exon told me in person that even HE did not have a need-to-know for all the activities at Wright-Patterson Air Force Base, even when he was base commander in the mid 60s. We cannot even be certain that the three officers would have been told about events and wreckage brought there more than a decade earlier. Their concern was the here-and-the-now and the near future and enemy (not alien) technology. It would have been much more likely to ship wreckage to a highly classified facility such as Area 51 (supposedly established in the late 1940s) or a part of Los Alamos or Sandia. With the very successful Manhattan Project as a shining example, it seems most likely that a Special Project would have been established outside the US Air Force, Navy or Army; let’s call it Operation Majestic 12.
dramatic event in recorded history would surely have been discussed by these men.” Security doesn’t work this way. In the first place: no need-to-know. In the second place: if they did know, they would have known better than to talk to anybody. Remember that Jesse Marcel was in Intelligence; Cavitt and Rickett were in the Counterintelligence Corps. None were pilots. Kent denigrates Pappy Henderson. I spoke with his wife, with his daughter, with his son, with his WW II Bombardier. He told none of these people before seeing a newspaper article about the crash, after 1980. He did tell his good friend, Dentist John Kromschroeder, before the article appeared; but with his promise on his honor as a former naval officer not to talk about it. John didn’t — until after the Unsolved mysteries program broadcast including Sappho Henderson. Pappy, after all, was entrusted with flying VIPs over the harbor in the Pacific after nuclear weapons were detonated there during operation Crossroads in 1946. Kent rattles on about the high reliability of today’s aircraft engines implying that alien spacecraft would be much more reliable. One would think that the only reason an airplane could crash was engine failure. Yet Kent himself tells of an MD-88 that crashed because the flaps weren’t set properly. The Valujet and TWA 800 crashes didn’t occur because there was engine failure, but apparently because of unexpected events having nothing to do with engine reliability. Landing gear have collapsed on airplanes. I hate to remind Kent, a professional pilot, that occasionally pilots make errors, too. Sometimes birds are ingested into engines, no fault of the engine. Kent states the craft must be capable of interstellar flight. Why? There are many reports of huge mother ships carrying smaller saucers. Fighters attacking North Vietnam didn’t fly there directly from the USA on each mission. Many flew from aircraft carriers located near the front. Kent acts as though the debris found by Mac Brazel must have been all there was. There have been aircraft accidents where an engine was found many miles from the fuselage. I am convinced, partly from the Eisenhower briefing, as delineated in TOP SECRET/MAJIC, that alien bodies (NOT time-shifted crash test dummies) and other wreckage from inside the craft, were found just a few miles from the debris field. Kent complains about nothing exotic being found because he apparently thinks he knows all about alien spacecraft construction. One of the things that Jesse Marcel Sr. impressed upon me in 1978 was the lack of anything conventional. Kent doesn’t know, for example, what the outer hull (skin?) of an alien vehicle would look like. How could indestructible material be spread out? By an incredible explosion induced by a lightning bolt dumping a huge amount of energy into a magnetoaerodynamic propulsion system. The steel left after the Oklahoma City bombing was still very strong even though broken. A radar beam, known to have been on, could have disrupted a propulsion or guidance system causing a collision. 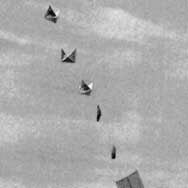 After all, 40% of the UFO sightings in the summer of 1947 according to Bloecher involved more than one vehicle. There is ample evidence, ignored totally by Kent and others who, for whatever reason, do not want it to be true, that another vehicle went down in the Plains of San Augustin as described in Crash at Corona, and having a gash in the outer hull like two parentheses face to face. Jesse Marcel spoke to Walter Haut of a piece of the very strong lightweight metal being rested on a rock with the other end on the ground when the sledgehammer was applied with no dent; hardly paper backed foil radar reflector easily torn by a four-year-old but pounded while flat on the ground. One of the worst things about Kent’s article is that it employs tunnel vision. What about the testimony of Bill Brazel, who found strange wreckage himself? Of Judd Roberts the radio station man? Of Elizabeth Tulk and Phyllis McGuire, the sheriff’s daughters? Of Loretta Procter, of other ranchers? I spoke with all of these in April. What about all the testimony relating to the Plains of San Augustine crash and the easy proof that the NSA and CIA are withholding UFO-related information. Why does Kent act as though as though flying disc and UFO mean the same thing? My lecture is Flying Saucers are Real, NOT UFOs are real because only some UFOs are flying saucers, though all flying saucers are UFOs. He acts as though the US government would never lie. When the Trinity Site nuclear explosion occurred in July 1945, a cover story was issued saying an ammunition dump had blown up — but, fortunately, no one was injured. During WW II elaborate disinformation schemes were used to misdirect enemy activity. 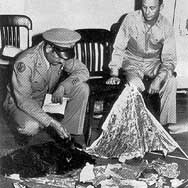 Yes, Virginia, governments do lie, and yes, the US government did recover two crashed alien saucers in New Mexico in July 1947 complete with bodies as described in Crash at Corona. Despite the attacks of noisy negativists. Kent blindly accepts the current stories from Cavitt and Newton although they completely contradict earlier stories told by them long before Roswell became a big deal. The stories even contradict each other as well as the testimony of Jesse Marcel and Lou Rickett as told to me first hand long ago. The only basis for even considering a Mogul balloon explanation is the disinformation newly told by Mac Brazel after being reprogrammed (according to Judd Roberts, Bill Brazel, Loretta Proctor, the Stricklands, Frank Joyce) and reported in the Daily Record on July 9, 1947 with the supposed June 14 recovery date and the sticks-and-foil nonsense. July 8 articles say the stuff was recovered “last week.” Even the RDR says the stuff covered an area 200 yards in diameter — neat trick for a few sticks and foil from a radar reflector. Brazel would never have made the difficult trip to Roswell for a tiny radar reflector. If Cavitt was being truthful, Brazel would have tossed the wreckage (Cavitt said it would fit in one vehicle) into the back of his pickup and there would have been nothing to take Marcel back to see. But wait: Cavitt now says he immediately recognized it as a balloon… covering an area 20 feet square. Captain McAndrew says it was a huge Mogul train of balloons over 500 feet long with 23 balloons and sonobuoys and radar reflectors. How could that come down in an area 20 feet on a side? Why didn’t Cavitt describe any foil and sticks? Could he have thought that he was supposed to say a balloon — rather than a Mogul Balloon? Why had Cavitt tried to convince Don Schmitt and Kevin Randle he wasn’t even based in Roswell in early July 1947, when he now, many years later, has clear recall of a simple balloon? Why did Cavitt lie when he said he went out with Jesse and Rickett and saw nobody else. There was no way he could ever have gone to the debris field without following Brazel. Marcel and Rickett each said they had gone out separately with Cavitt. Why doesn’t Kent tell us the last line of the July 9 article: “I am sure what I found was not any weather observation balloon.” Remember that Brazel had previously recovered balloons. Why doesn’t Kent mention that Colonel Richard Weaver, in his huge Air Force report, intentionally eliminated a most important phrase from a July 8, 1947, FBI memo about the supposed balloon: “The object found resembles a high altitude weather balloon with a radar reflector [but that telephonic conversation between their office and Wright Field had not borne out this belief] … disc and balloon being transported.” The intent is clearly to deceive. Newton’s testimony is very different now from what it was in 1979 to Bill Moore after I had located him. Could it possibly be relevant that both are loyal career officers on nice pensions who need no hassles in retirement? Remember that almost 20 years ago Jesse told me that the wreckage covered a huge area hundreds of yards long and that he and Cavitt each took away only a small portion of it. Remember, too, that Mrs. Cavitt told Bill Moore, “He’s not going to tell you anything. They told him not to.” Bill had unfortunately mentioned at the Toronto MUFON conference that we had located Cavitt — before he had been visited. Kent says the symbols drawn based upon Jesse Jr.’s testimony are the same as those recalled by Newton. They look about as much alike to me as Greek and Russian letters. Did it not occur to Kent that Newton might have seen Jesse’s symbols at the Roswell museum or on an extruded replica? Funny, he hadn’t mentioned the symbols years ago. Funny that the CIA’s most sophisticated photo analysis couldn’t find any of that wonderful toy factory tape in the photos. In short, Kent Jeffrey’s enthusiastic “definitive” article is a splendid example of propaganda — NOT of investigation.